Citation: C N Trueman "Memories of Operation Barbarossa"
The belief thatOperation Barbarossa(1941) was a massive military success in its initial stages tends to be the accepted norm amongst many military historians. However, though Operation Barbarossa made huge inroads into the Soviet Union the warning signs of major problems ahead were never heeded by the senior military command who were basking in the success of the Nazi war machine as Barbarossa drove back the Red Army and captured millions of men and destroyed vast amounts of Soviet military machinery. What were the problems that were overshadowed by the success of Barbarossa? Even the average infantry man was aware that there would be trouble ahead as the letters home to loved ones indicated. A twenty-year old infantryman called Harald Henry identified two main issues. He believed that the tanks of the Wehrmacht were moving too far ahead of the infantry and that the pace of their advance would lead to major problems in supply later on in the campaign against the Red Army. He also noted the sheer exhaustion he and his fellow infantrymen suffered as a result of this as they were required to march as far as was humanly possible to keep near to the tank units. 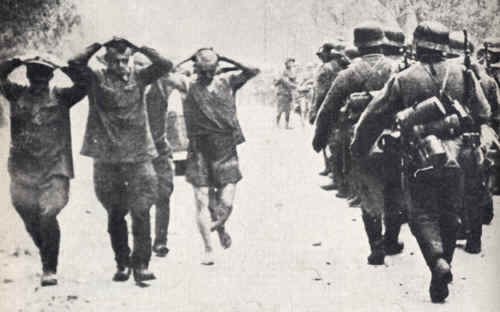 Hitler’s decision to move tanks from Army Group Centre and move them to support the attacks on Leningradin the north and the Ukraine in the south meant that the infantry in the central attack on Moscow had to do so with little of the armoured support that had benefited them in the early weeks of Barbarossa. They were soon to suffer from the appalling weather that was to become so decisive in the whole campaign. “We were in a blizzard. It penetrated our coats, our clothing gradually got soaked through, freezing stiff against our bodies. We were feeling unbelievably ill in the stomach and bowel. Lice! Frost gripped my pus-infected fingers. I wrapped a towel round my ravaged hands. My face was contorted with tears. Torment without end. I am shattered in every fibre of my being” Harald Henry. In October 1942 Operation Typhoon was launched. This was the Nazis main attempt to capture Moscow. Stalin put the defence of Moscow in the hands of Georgy Zhukov. Though some German advance troops got to the outskirts of the city, Zhukov’s work ensured that Moscow did not fall. The German attackers had to endure temperatures as low as –35 degrees during the winter nights. On November 15th, the Germans launched their main offensive but it came to nothing. On December 15th, Zhukov launched his counter-offensive using fresh troops brought in from Siberia who were used to the freezing temperatures. Within ten days of the attack, the German army had been pushed back 100 miles and had lost half-a-million men. Operation Barbarossa had failed in its objective but it had also been responsible for the deaths of tens of thousands of trained men – a loss the Wehrmacht was never going to recover from.